"Friendship and concern does not end at death, but continues," Fr. 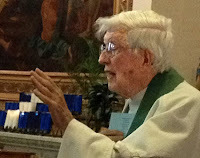 Henry Madigan, OFM Conv., told some 60 people Nov. 18 at a Service of Remembrance, co-sponsored by St. Joseph Fraternity and St. Joseph-St. Patrick Church. "We have the opportunity to reflect on how they have touched our lives and to reflect on how they are part of the reality of God's church."